Currently, there is extensive experience test of Albit on grapevine. 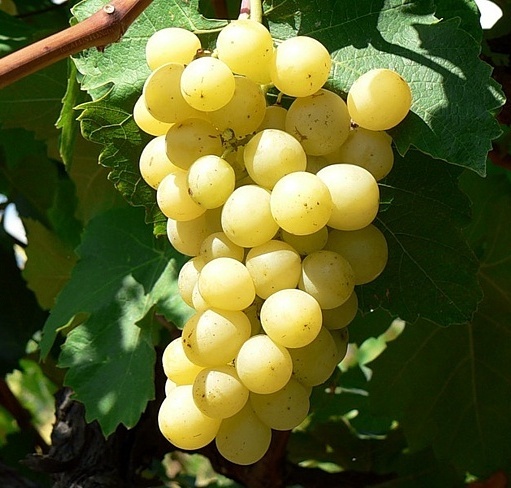 Biostimulant is tested in field trials conducted in 2002-2004 in South-Caucasian region on the following varieties of grapevine: Agat Donskoij, Denisovskij, Riton, Riesling, Shardone, Muscat Hamburgskij. Field trials were conducted in VNII Potapenko National Institute of Viticulture and Wine-making (RAAS) (Novocherkassk) and North-Caucasian Zonal Institute of Gardening and Viticulture (RAAS) (SKZNIISV, Krasnodar) in farms of Rostov region and Krasnodar krai, respectively. Positive results were revealed in field trials in Ukraine: in National Scientific center «Tairov's Institute of Viticulture and Wine production» and farm «Tairovskoe» on varieties Cabernet Sauvignon, Odesskii rannii, Odesskii chernii. Since 2012, field trials on grapevine with Albit have been conducted in Czech Republic (Institute of agriculture researches, Kromeriz, Zlinskii krai, variety Neuburske), in Dagestan (Dagestan NII of Viticulture and Grape processed products, Mamedkala, variety Rkaciteli, Prem'er), in Crimea (National Institute of Grapevine and Wine, Magarach, Yalta) – on table varieties Moldova, Asma, Italian muscadine, Red Globe, Chocolate and technical varieties Cabernet Sauvignon, Sira, Pink muscadine). Albit had stimulating and protective action on grapevine and also promoted of restoring of vine after frosts in conducted field trials. Stimulation of plant growth was detected on all plant organs: stems, leaves and bunches. Albit increased annual increment of shoots by 28–64 %, single shoot increment by 28–56 %, ripened shoot increment by 59–64 %, number of ripened grapes by 3.7–13.6 %, weight and plumpness of a bunch by 21–24 %. As an example, here are results of trials in Krasnodar krai (Table 1). Data, obtained in farm Vinarstvi Bukovsky (Kobyli region, Moravia, Czech Republic), clearly illustrate growth promoting effect of Albit. In the spring of 2014, 70 % of the vineyards of this farm were destroyed by hail according to assessment of the insurance company. Thanks to the well-timed application of Albit, the percentage of destruction of grapes has been reduced from 70 to 20 %. In this area each year hail caused great damage to vineyards, but in previous years, when Albit was not used, reduction of the lesion after hail was not occurred. Besides hail, a very important problem of vineyards is overwintering. Since 2014, National Institute of Grapevine and Wine (Magarach, Yalta) have been studying of Albit efficacy on grapevine after overwintering. Field trials were conducted on var. Cabernet Sauvignon, Moldova, Asma, Italian muscadine. It was shown that Albit promoted of potential ability of grapevine to resist of low temperatures. Coefficient of fruiting, starch content in shoots, differentiation of shoots were measured in these trials (Table 2). As a result, the actual ability of the vine plantations to tolerate frost rises by 22.4-27.9%. Albit application allows to shift the boundary of the critical negative temperatures of all varieties to lower values (ca. by 2°C). Treatments with Albit provide protection of grapevine against oidium (average BE 70 %) and powdery mildew (average BE 50.5 %). Albit on grapevine is registered like a fungicide (State Registration no. 1686-09-107-150-0-0-3-1) against oidium (at a slight development of disease). Fungicidal activity of Albit was detected at disease prevalence 9-100 % and disease development 1-90 %. Albit retarded disease development on both vegetative (leaves and shoots) and generative (bunches) organs. Trials of North-Caucasian Institute of Horticulture and Viticulture also revealed high efficiency of Albit against branch necrosis (BE 79.2 %); however, it requires additional studying. Possibly, Albit-dependent acceleration of shoot growth is partially determined by Albit activity against branch necrosis, since its pathogenic agent (Phomopsis viticola Sacc.) causes damping-off of bunches and death of buds. The final result of stimulating and protective action of Albit is increased yield of grapes. According to data of trials, application of Albit increases yield averagely by 23.1 % (yield increase 1.93 t/ha). Use of Albit in Crimea (2014) increased yield of table varieties by 10.9 % (drip irrigation) and by 26.5-63.8 % (rain-fed conditions). Data on Albit efficacy on grapevine in different regions are summarized in Table 3. Application recommendations: Foliar spraying of vineyard is performed with Albit solution conc. 3 g/10 L. Recommended consumption rate of Albit is 260-325 g/ha (200-250 mL/ha). Consumption rate of working solution – 1000 L/ha, 10 L/100 m2. Sprayings should be carried out before and after blossoming, at the beginning of grapes growth, in stages of bunch formation and grape coloration. As a rule, 3 sprayings in vegetation period is enough, but number of treatments may be increased up to 5, if it is necessary. Number of treatments is determined by length of plant protection period of Albit (15 days approximately). Earlier treatments are the most effective ones. Application of Albit should be incorporated into the standard grapevine protection system used in vineries. Albit is used in tank mixes with chemical insecticides and fungicides in frames of scheduled treatments against diseases and pests. Application of Albit makes possible decreasing or even complete abolishment of using of chemical fungicides, that decreases treatment expenses and helps to obtain organic production. Portion of fungicides which might be replaced with Albit, depends on kind grapevine diseases: mildew and oidium. According to data in Krasnodar krai and Rostov oblast, efficiency of Albit against powdery mildew is not inferior to standard chemical plant protection products. Fungicidal activity of Albit can be observed at both low and high level of disease development (development – up to 90 %, prevalence – up to 100 %). Therefore, for control of powdery mildew, Albit is able to replace chemical fungicides completely. Efficiency of Albit against powdery mildew of grapevine is considerably lower than against oidium (~50 %). Moreover, protective action of biostimulant against mildew is considerably decreased with increase of damage rate (Fig. 2). In figure you can see data of field trials VNIIViV and SKZNIISV according researches of biological efficаcy of Albit and chemical fungicides against this disease (logarithmic approximation). Full fungicide effect of Albit against mildew on level of chemical standard (shown in the plot) can be considered at degree of development of this disease less than 5 %. At higher level of development disease, Albit сan be applied together with chemical fungicides. At combination chemical fungicides with Albit, their consumption rate may be considerably decreased. Our field trials were shown, that at use of Albit in mix with halved doses of chemical fungicides, efficacy protective treatments against mildew does not inferior use of full doses of «chemistry». In many cases, comprehensive treatment with use of Albit is even more effective by 5–10 % (Fig. 2). Fig. 2. Dependence of effectiveness of fungicidal treatments of grapevine on disease development (data of all conducted tests). 1 – Efficiency of Albit against powdery mildew; 2 – Efficiency of Albit against downy mildew; 3 – Efficiency of standart chemical protection against powdery mildew. 28.07.04 – Metaksil 2.5 kg/hectare + Tiovit (insecticide based on elementary sulfur) 8 kg/hectare. At use of Albit, application rates of these pesticides were decreased twice and they were mixed with Albit. Resulting efficiency of original treatment against downy mildew was 92 %, whereas combination of Albit and halved doses was 99 %. In other trials the similar chemical pesticides were used. Chemical pesticides based on a.i. mancozeb + dimetamorph, dimethoate, mancozeb, mefenoxam, spiroxamine + tebuconazole + triadimenol, сopper oxychloride, sulfur, flutriafol, triadimefon, Bordeaux mixture et al. In other trials of North-Caucasian Institute of Horticulture and Viticulture (2003), application of Albit in combination with decreased doses of fungicides (based on сopper oxychloride, dimethoate, flutriafol, mancozeb + dimetamorph, sulfur and dithianon) retarded development of grapevine diseases (powdery and downy mildew) for quite long period (1.5 month). Using of chemical pesticides of last generations aggravates problem of acquiring resistance to pathogens. So, partial or complete substitution of chemical fungicides to Albit has a great importance because resistance is not almost delivered to immunizers. Combination Albit + fungicide demonstrates the highest stimulation for forming grape bunches compared with pure Albit and chemical pesticides. In field trials SKZNIISV the average mass of grape bunch var. Risling was increased by 32 % to control vs. 28 % (fungicide treatment) at combination Albit + fungicide. In farm «Golubaya buhta» (var. Shardone) this parameters were 25 and 35 %, respectively. Bunch performing in chemical standard – 4.4 score, chemical standard + Albit – 4.8 score (Table 1). In field trial VNIIViV, combination Albit + pesticide based on triadimefon (0.1 kg/ha) increased percentage of berries maturation var. Denisovskii and Agat donskoi by 7-21 %compared to pure chemical pesticide (0.2 kg/ha). Average annual growth per plant shoot in variant with biostimulant based on triadimefon was 334 cm, in combination with Albit – 424 cm. In field trials SKZNIISV use of Albit with halve doses fungicides allows to control the development of grapevine diseases by 84-100 %. All professional winegrowers know that it is often difficult to achieve full gamma of flavoring qualities in new soil-climate conditions of grapevine varieties brought from far away. For example, in Zakarpattya Regions of Ukraine on vineyards of famous farms «CHIZAI» and «AISBERG», use of Albit increased the survival rate of cuttings, grapevine performing, strengthen of grapevine, provides excellent and quality crop (the best in the region) at reducing the consumption rate of chemical fungicides. But most grapevine aroma amazes agronomists - varietal aromas repeatedly strengthened. Thus, strength of aroma proportional goes into wines. It was noted that in farm «Magarach» (2011) old Crimean table variety Asma (in recent decades variety Asma lost several tasting and biochemical characteristics) under Albit treatment restored usual bouquet of flavor. Albit treatment increased total score of taste and flavor and led to more uniform color of berries (Fig. 3). Perhaps, when use of chemical fungicides in full dose, pesticide stress interferes realization of genetically incorporated programs of synthesis of aromatic metabolites in ripening berries, and Albit took off this stress limitation while maintaining protection against diseases. Fig. 3. Albit treatment improved trading parameters of quality, varietal fragrance, yield of grape variety Asma («Magarach», Crimea, 2014). Left – control, right – Albit treatment (with uniform color of berries). 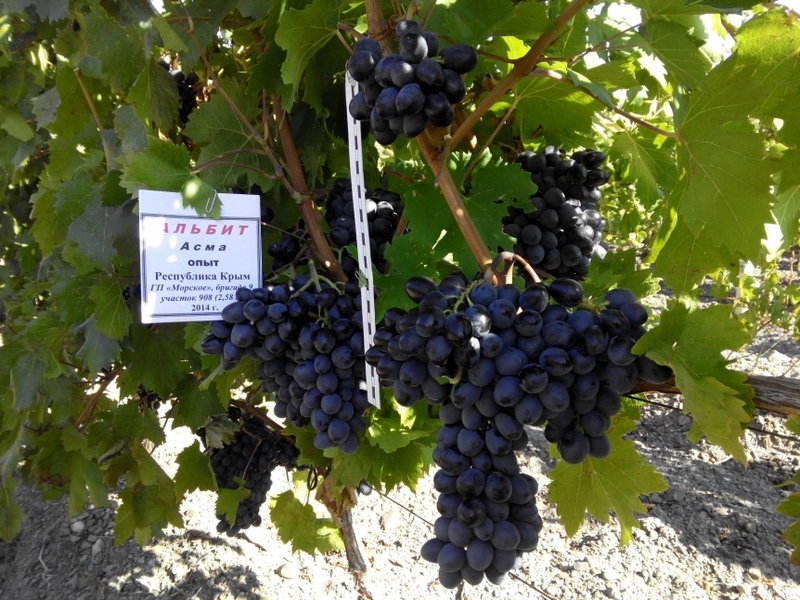 Biostimulant Albit (Liquid paste) has strong antidote and growth-stimulating action, allowing to save yield as well as considerably increase productive parameters of table and technical varieties of grapevine compared to control (standard scheme of plant protection) even in extremely droughty conditions in 2014). 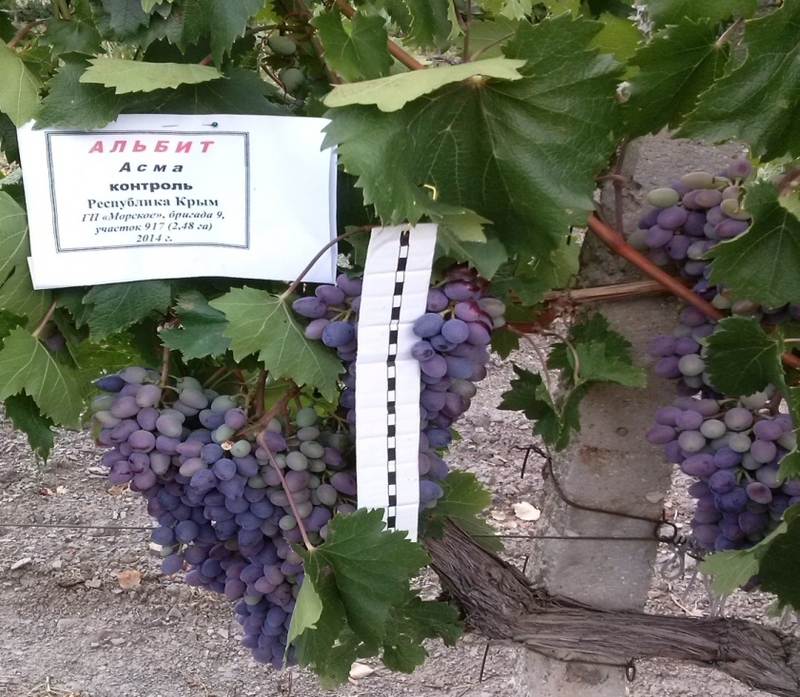 Positive effect of Albit ярко проявлялось как in variants with use full dose of chemical fungicides as well as when using reduced consumption rate of fungicides; on table as well as technical varieties of grapevine; on drip irrigation as well as on rain-fed conditions. When using Albit, yield was increased by 10.9 % vs. control (standard scheme of plant protection without Albit) via drip irrigation, and on rain-fed conditions by 26.5–63.8 %. Caliber and weight of 100 grape berries were significantly increased (by 9.9–101.1 % to control), bunch weight by 7.0–86.6 %. Albit treatment had positive effect on several parameters of harvest quality. Concentration of sugars in technical grape var. Cabernet Sauvignon during harvesting exceeded control parameters by 13.5 %, titrated acidity was less than in control by 6.7 %. In table varieties of grape (Moldova, Asma) these parameters practically unchanged, however, based on results of organoleptic evaluation of berries, score of outward appearance (bunch elegance and berries) was increased by 18.7–46.1 % to control, taste and fragrance by 9.5–16.2 %. Uniform color of berries is noted. In all varieties under Albit treatment decreasing of content of pesticide residues in yield is noted (by 31–90 % vs. control). Using Albit treatment of studied grape varieties also affected on synthesis of phenolic compounds and flavoring substances. In average, in all varieties Albit led to increasing the content of anthocyanin pigments in berries by 24.4 %, flavonols by 5.9 %, stilbenes by 32.8 %, and sum of flavanols is increased only in drip irrigation. It can be noted that increasing was observed in variants with decreased consumption rate of fungicides. Since Albit has immunizing effect against diseases, in terms of product quality, it is the most advisable to use Albit with reduced dosages of chemical fungicides by 20-25 %. Albit improved grape preservation during storage by 31.7-100 %, contributing reduction of natural decline the weight of bunches by 28.1-52.8 % to control and preservation of taste and fragrance of berries. In addition, Albit treatment contributed to increasing the proportion of colloid-bound water and reduction of free fraction of water in the berries, which determined the higher tasting evaluation in parameter «properties of peel and pulp of berries». This feature determines improvement of barriers safety as well as this feature, probably, is a fundamental mechanism of increase of plant drought resistance. The revealed regularities were also confirmed by field trials in 2015 and 2016. The results of field trial (2016) are presented in Table 4. In Potapenko All-Russia Institute of Viticulture and Wine-making (Novocherkassk, Rostov oblast), a high efficacy of Albit for obtaining of hybrid seeds and breeding seedlings of grapevine was observed. In this Scientific Institute method for obtaining of transplanted seedlings with using Albit (Malyh, Titova, 2015) was developed and patented: joining of tree stock with scion, waxing of inoculations, stratification on glauconite, landing into nursery (for seedlings of the first cultivation year) and treatment of plants. Albit is used during stratification step as additive to nutritious medium (concentration 0.4%) and for seedlings landed into nursery (solution of Albit 0.2%, two times per month during vegetation season; totally, 6 times). Application of Albit for activization of jointing of inoculation allows to avoid application of chemical fungicides during stratification period. In this case, seedlings are resistant to pests and diseases, while reducing the cost of production. Due to the intensification of physiological and biochemical processes, Albit increases establishment of inoculations in nursery and accelerates growth and development of plants: survival rate of cuttings increases by 10-70%. Plant growth, number of leaves, average length of inoculation (up to 90% higher than in control), average length of matured shoots (up to 2 times higher than in control), area of leaf surface (up to 80% higher than in control) increase. The yield of inoculated seedlings increases by 26–110%. An increased content of microelements is observed in shoots, leaves and roots. At the same time, the growth of shoots during the vegetative period is enhanced both in the apical and in the lateral meristem. The maturing and the quality of the planting material are improved. It is considered to be prospectively use of Albit on grapevine on own plots. Complex action biostimulant allows without use of «chemistry» to provide protection of home vineyard against diseases, to reinforce growth of vine and to increase its crop. So, certainly Albit will be demand by private owners. In addition, сonsumption rate of Albit per 100 m2 is only 3 mL. With use of Albit horticulturist innovator V.E. Tochilin (Novopolotsk, Belarus) not only effectively protects his most northerly vineyard against diseases and frosts, but also gets an impressive crops of environmentally friendly products of dozens of different varieties. Albit is one of the few biostimulants for protective of plants against diseases that are authorized for use on grapes, on the sanitary classification relating to hazard class 4 (practically non-toxic compounds). Biostimulant is allowed to use in organic farming in European Union countries. Use of Albit allows to reduce applying more toxic standard fungicides, assigned to I-III classes of hazard. Some of them (copper-containing) are not only toxic for animals and human, but often cause burns on grapevine. Many chemical pesticides, used for grapevine protection, can be persisted in crop and can cause allergies, poisonings, dysfunctions and even cumulative genetic effects in use of grapes into food. Based on data in Magarach, use of Albit led to reducing of residual pesticides in the crop by 31 to 90 % to control. Therefore, from the point of view of environmental safety and nutritional value of obtained products, reduction of chemical press at grapevine treatments is also important, especially in the cultivation of food varieties.